I've been playing around with rendering shadow maps using FBOs in OpenGL. I set up a simple directional light in my engine and managed to get a shadow map rendered. My Scene is a big castle and the shadow was cast over most of the other objects in the scene. 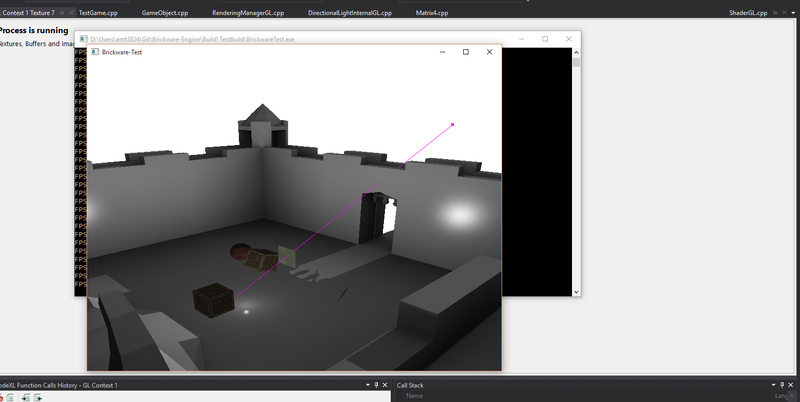 Out of curiosity I removed the castle and just added a simple floor and my shadow map no longer renders properly. It seems that only one object at a time is making it through my render pass and onto the shadow map. //Other user defined render passes here? The RenderShadowMap(Shader* shadowShader) call is a bit more complicated but it seems the orthographic view is setup properly, the look at view is also correct. I have verified that the matrices that are generated by my math functions work. And the final bit of code that I think is relevant is the RenderPass() method which just loops through all renderable objects and tries to render them with RenderObjectGL(Renderable renderable). I figured some images to illustrate the problem would be pretty useful. Interestingly the shadow map is really just of the castle, the other objects aren't in the shadow map. Which again seems to be of just the floor, none of the other objects in my scene. Is there some aspect of FBOs that I'm missing here? After much deliberation and a stroke of insight I figured out what the problem was. It was a problem with my shadow map vertex shader; I wasn't putting the objects into model space. That means that all objects were being rendered at 0, 0, 0 with a scale of 1 and no rotation. OOPS. Properly applying a model matrix in the shader managed to fix the issue. There was some extra architecture that went into getting the model matrix sent to the shadow shader that might be interesting. Not the answer you're looking for? Browse other questions tagged opengl c++ shadows shadow-mapping fbo or ask your own question. Why does my simple OpenGL shadow map fail? How do I write to a 16-bit depth buffer using Monogame and HLSL?